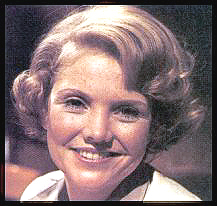 She is as luminous today as she was on the afternoon 20 years ago this March when she debuted on One Life to Live and put her own unmistakable stamp on the role of Victoria lord Buchanan. 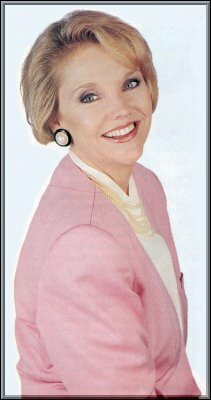 "I didn't know then that they were just trying me out, " Erika Slezak recalls with a laugh. "It was my first job in television; I didn't even know there would be line changes. I was a basket case." That her nervousness never showed should come as no surprise to anyone who has ever seen her performance as the high.born but compassionate Viki, a portrayal that has earned the actress two Emmy Awards and the enduring affection of millions of fans. Through widowhood and divorce, split personality and stroke, even time travel and near death, Viki has maintained the inner strength that is the key, Erika says, to her character. "Viki is an extremely strong woman who gets into a lot of trouble because she's willing to do just about anything for anybody without regard for herself," she explains. "Her priorities have always been strongly in order, and she truly tries to do what is right. In fact, she agonizes so about her decisions that the audience practically has to sympathize with her." Decisions seem to come more easily to Erika, who was determined as a child to become an actress, despite the misgivings of her father, film and theater star Walter Slezak. After studying at the Royal Academy of Dramatic Arts in London, she began her career at repertory theaters in Milwaukee and Houston, where she worked for five years before coming to New York to, as she puts it, "conquer Broadway. " Instead, she conquered daytime TV. What's helped make her long tenure possible, Erika says with characteristic modesty, is the "fabulous material I've had to work with. The writers and producers have given me so much to do that's different and interesting. Very few actors get a chance to act as much as I do and make a living at it. So as an actress, I try very hard to bring something to the table. Keeping Viki fresh is my job." husband Steve Burke (Bernard Grant). Playing Niki Smith, Viki's other personality, has provided Erika with some of her happiest moments on the OLTL set. “Everything Viki is, Niki is not, " she observes. "It's such fun to be somebody so different, to wear the red wig and the trashy clothes. " 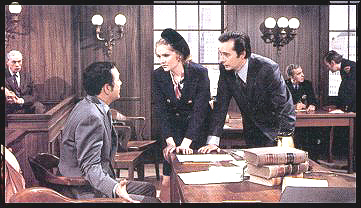 But three other storylines also stand out among the many in which Viki has played a featured role: her "return" to the Wild West as Miss Ginny, her visit to "heaven", and her recent stroke. "Miss Ginny was the first character I ever created from start to finish. The writers gave me an outline, saw what I did, and then did more; we played off each other. It was as though she was a baby, a total innocent, and I was able to make her grow up. "The heaven storyline was purely a flight of fancy, fluffy and soft: I arrived on a slide, flew through clouds, walked through walls. It was such a high to be doing scenes with characters from the past, and probably the biggest ego trip any actress ever had, since the whole thing focused on Viki. And I remember often thinking how great it would be if heaven were really like that." 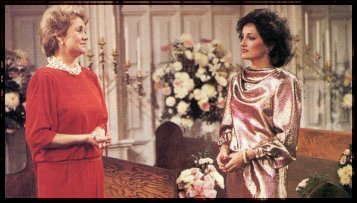 stepmother Dorian Lord (Robin Strasser). Playing a stroke victim has yielded other satisfactions, says Erika. "I've gotten so many letters from fans who say that watching Viki is like watching their mother or their aunt; it's that painful. It's been very difficult for me, too, because you have to convey everything without talking or moving, but when you hear that kind of response [from viewers], you know it's working.